Levi is a very popular resort with a bustling attractive village centre, festively lit streets and a wide selection of souvenir shops, cafés, bars and restaurants all within easy walking distance. 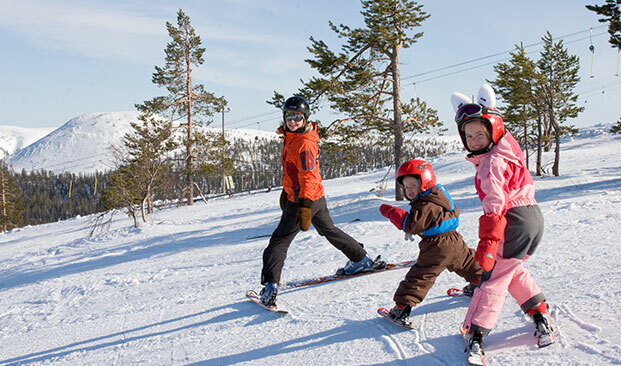 As Finland's most famous ski resort, hosting the World Cup ski events on its uncrowded snow-sure pistes, Levi is a brilliant place for families to try skiing for the first time, as well as improving your skills. 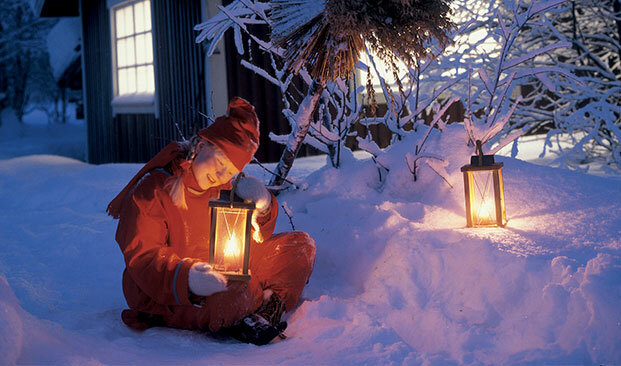 Santa's Workshop and our activity locations are all only a short drive from resort, and the immediate local scenery is easily accessed by foot or snowshoes so you do not have to venture far to experience the wilderness and increase your chances of seeing the Northern Lights - making the most out of your short stay. Still got a question? See our Santa Break FAQs. We are pleased to introduce the stylish, slope side Hotel Levi Panorama for your Santa Break 2018. This excellent hotel is in a stunning location at the top of Levi fell with wonderful wide-reaching views over the ski slopes, Levi resort and the surrounding winter landscape. This deservedly popular high-quality hotel represents excellent value and is known for its great cuisine, family friendly atmosphere and relaxing spa facilities. Choose from attractive hotel rooms, split-level Family Duplex rooms or the excellent 4-room Family Suites. 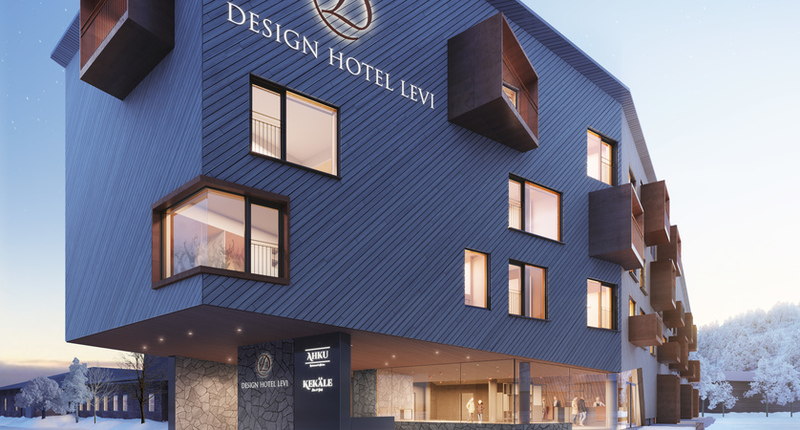 This excellent child-friendly hotel, now called 'Levi Hotel Spa' is the resort’s flagship property situated in a central yet peaceful location. It's superb 'Spa Water World' and 'Chidren's Playhouse' make it a perfect choice for families. 3 nights Sunday to Wednesday. 4 nights Wednesday to Sunday. 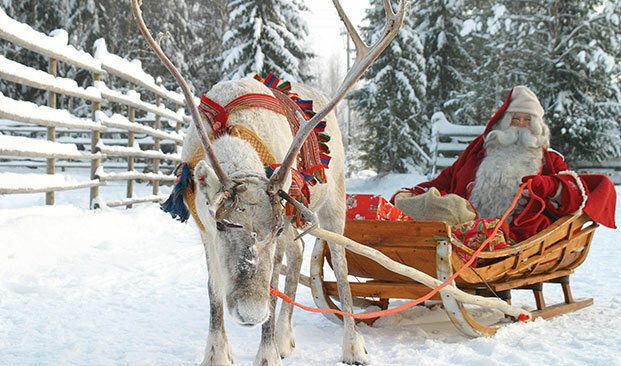 DAY 1 Your Inghams Santa Breaks Reps will be waiting at Kittilä airport to warmly welcome you to Lapland and bring you by coach to your accommodation. Shortly after arriving in resort, you will collect your complimentary thermal suits and boots, which you will keep for the duration of your stay. There will be plenty of time to explore your snowy surroundings, build snowmen, find a toboggan and throw those mandatory snowballs. Join us for a welcome get-together to help you plan your activities for the next few days - see below for options. Other activities such as horse-sleigh rides and visits to the SnowHotel (from mid-Dec) may also be available locally. DAY 3 Make the most of your stay by booking our exciting and excellent-value optional excursions. Perhaps a combined husky and reindeer farm visit with sleigh rides in the morning, followed by an exhilarating family-friendly snowmobile safari in the afternoon - see details below. Or why not try a few hours skiing on the slopes? Levi is an excellent resort to give downhill skiing a go if you haven’t tried it before. Alternatively, wander around the local shops collecting souvenirs or relax and enjoy a sauna at your accommodation in true Finnish style! DAY 4 (for 4 night guests only)Levi is also Finland’s most famous ski resort, hosting World Cup ski events on its uncrowded snowsure pistes, and guests on the 4-night Santa Break can pre-book our exclusive Inghams 'Ski Taster' package to give the sport a go on Levi's beginner-friendly slopes (tuition and instructor included). Don't worry, you don't necessarily have to bring separate ski gear with you as many guests ski in their included all-in-one thermal suits. However, we would recommend bringing a pair of ski socks with you if you plan to try skiing to make sure your feet are comfortable. Or perhaps you would prefer to wander around the local craft shops, relax at the hotel swimming pool or simply play in the snow. Then get ready for a festive gala dinner in the evening (see Day 3 for details). After dinner, perhaps the Northern Lights will appear for that perfect end to your holiday. DAY 5 (or DAY 4 for 3 night guests) After a magical few days, it’s time to say goodbye to your new friends before being transferred by coach to the airport for your flight home. Please note the above itinerary may vary according to arrival and departure times. An animal lover’s dream and a great value excursion that makes the most of your valuable holiday time. Meet some of Santa's reindeer deep in their silent forest hideaway. 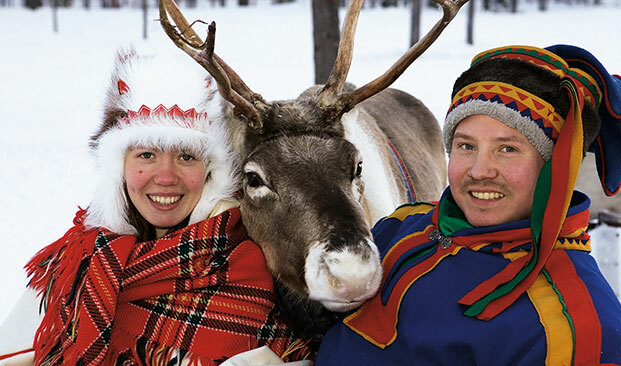 Learn about their way of life from colourful local Sámi herders and enjoy a romantic reindeer sleigh ride for 1½km across the snowy landscape. Delicious hot fruit juice and cake will be served. Next it’s time to visit the huskies in their nearby cosy wilderness home. Learn about their way of life while huddled around a campfire inside a traditional Lappish Kota hut. 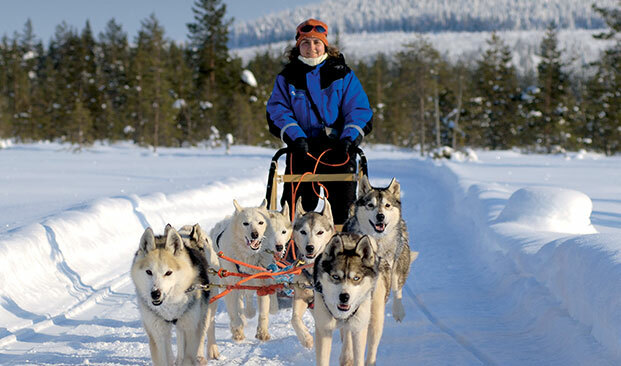 Visit the husky puppies and enjoy a 2km dog-sled ride through the sparkling winter landscape. Experience an exhilarating 25km ride through beautiful scenery, snow-laden forests and frozen lakes. Snowmobiles are fun and easy to ride on your own or sharing with a passenger. Children either share with an adult (over 8yrs only, subject to height restrictions) or are towed in a covered sled behind the guide. English speaking instructors. But beware, you may enjoy yourself so much that you will want to return to experience one of our 7 night holidays. Ski Taster Package is for guests 5yrs or older. Child excursion age is 4-12yrs incl. Children under 4yrs old are FREE but not allowed on snowmobile safari and will be required to pay locally for transportation to reindeer & husky safari. Snowmobile drivers must be 18yrs old and bring a full driver's license. 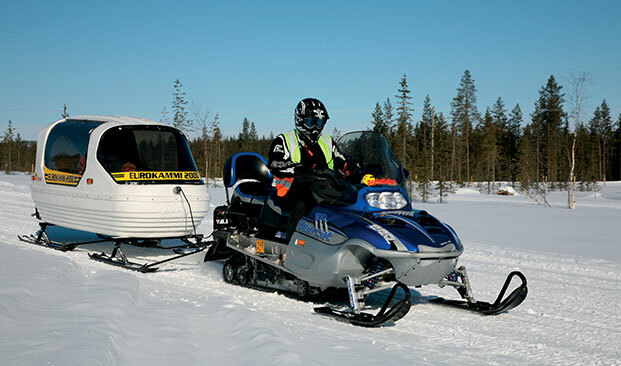 On snowmobile excursions Inghams (and most other travel policies) will provide cover for personal and medical expenses but not for damage to the snowmobile etc. If the snowmobile is damaged then a compulsory insurance excess of approx. €850 in Levi and €850 in Ylläs will be payable direct to the excursion provider. Please note that we act at all times as the selling agent for the supplier of excursions and activities. See Terms & Conditions for further information. Please note some flight supplements may apply. Transfer Approx. 20 mins.